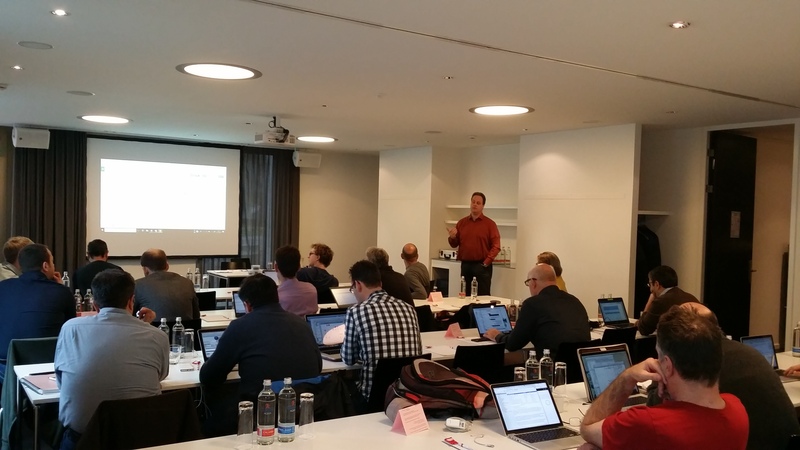 OpenRiskNet, a pan-European consortium funded by Horizon 2020 to develop open e-infrastructure for predictive toxicology and risk assessment, has demonstrated the results on approaches for harmonised application programming interfaces and semantic interoperability during training sessions and scientific presentations at the OpenTox Euro 2017 Conference in Basel, November 21-23 2017. Prior to these activities, the annual consortium meeting was held on 20 November to discuss the progress after twelve months in the project and plan the next steps. Moreover, the 11 European partners that make up OpenRiskNet are now launching an Associate Partner Programme to build global reach into its work. “OpenRiskNet builds on the ethos of OpenTox pairing experts from different disciplines to come together to build practical approaches and tools for integration of toxicological information into workable environments with the goal to decrease uncertainties in chemical and nanoparticle human safety prediction. The associated partner program will be used to accelerate these developments”, says Dr. Paul Jennings, Vrije Universiteit Amsterdam. Tens of thousands of chemicals, cosmetic ingredients, therapeutic agents, and nanomaterials need urgent safety assessment. New in vitro and in silico methods have the potential to offer a reliable, cheaper alternative to classical animal testing, supported by databases, algorithms and tools for hazard prediction, toxicokinetics and in vitro-in vivo extrapolation. However, since these services are being developed and provided by groups working independently worldwide, no standardised way exists to access the data or run modelling workflows resulting in large overhead when combining them into risk assessment workflows. OpenRiskNet aims to overcome this fragmentation. “We’re building a knowledge-sharing community, with a common language and working standards so that data from all over the world can be combined”, explains Dr. Barry Hardy, CEO of Douglas Connect, coordinators of the OpenRiskNet consortium. An Associate Partner can be an organisation (university, institute, consortium, NGO), a small/medium enterprise or large commercial company. By inviting scientists worldwide to become Associate Partners, OpenRiskNet wants to make its tools available globally and to ensure the usability of the infrastructure and alignment with the community. Instead of a “top-down” approach, whereby the consortium would publish specifications for APIs and ask scientists to adapt their software accordingly, OpenRiskNet collects and harmonises the APIs of Partners and Associated Partners and makes them interoperable. This “bottom up” concept avoids repetitive iteration cycles and allows flexibility for APIs to evolve as new services are added in time. SNIC Science Cloud of the Swedish National Infrastructure for Computing, providing computer resources. “OpenRiskNet will provide ways of creating instances of a scalable computational environment where risk assessment can be performed and will allow an organisation to create their own private environment, either using the cloud or in-house hardware. Having Rad Hat and the SNIC Science Cloud assisting us with this has been invaluable, and allowed us to migrate the first partner application, the Squonk Computational notebook, to this infrastructure” says Dr. Tim Dudgeon, CEO of Informatics Matters Ltd.
“The use of Open Licensing and Open Standards make integration of solutions easier and cheaper. For example, Open ontologies allow annotation of data, open and proprietary, making your data more FAIR (findable, accessible, interoperable and re-usable), complying with contemporary European expectations. Importantly, the increased interoperability boosts the value of your data”, says Dr. Egon Willighagen, Maastricht University. “We are pleased to be helping the OpenRiskNet effort by bringing our knowledge, expertise and technologies in the areas of OpenShift, Kubernetes and enterprise microservices because we think there are benefits they can bring to the OpenRiskNet effort as well as benefits we can gain by closer collaboration with the group”, says Dr. Mark Little, vice president, Engineering, Red Hat. Red Hat and OpenShift are trademarks or registered trademarks of Red Hat, Inc. or its subsidiaries in the U.S. and other countries. At OpenTox Euro 2017, OpenRiskNet demonstrated the applicability of its solutions in a number of training sessions and hackathons. Different stakeholders (mainly developers and researchers, but also risk assessors and regulators) were able to judge such real-world applications in the area of workflow tools like the Squonk Computational Notebook, MDStudio, Nextflow, the Jaqpot online modelling platform and read-across applications using chemical and biological similarity, and get hands-on experience in biokinetics modelling and ontology development. This training will continue with virtual training sessions throughout the year and during the next general assembly of OpenRiskNet and the OpenTox Euro conference in Athens next year. “The OpenRiskNet training session was a great opportunity to demonstrate and test new functionalities of our Jaqpot tool and receive valuable feedback for upcoming development of the platform and the integration into the ORN infrastructure”, says Professor Harry Sarimveis, National Technical University of Athens.